Saffire Pro 40 is one of the best audio interfaces around $500. 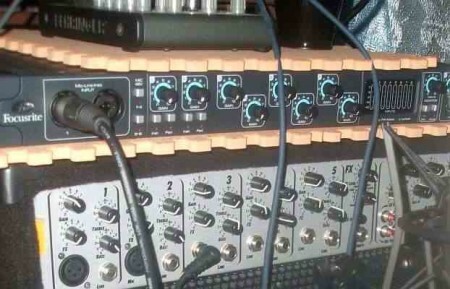 It can accept 8 preamp inputs and provide around 20 inputs/20 outputs total. It is capable of recording up to 24-bit/96KHz resolution. It is using Firewire as a connection from the hardware to your PC. This post would list down the potential issues and possible solutions in using Saffire Pro 40. Knowing this in advance, you will learn how to avoid the potential problems associated with using this audio interface. I am using this audio interface for around 2 months already and all problems are not related to the hardware itself but more on the PC hardware and software configuration. The Windows XP OS has been installed since 2006 and it has never been reinstalled and repaired. Also the hard drives are kind of faulty and I received some check disk errors during booting. Finally I went to install Saffire Pro 40 drivers and attached the hardware to my PC, so what’s the result? Audio drop out and latency. At first, I am worried it can be related to the hardware and driver. So I went to reinstall the driver by going to the Focusrite website. But the problem is still not resolved. Occasionally it went well, but when I play some MP3 files via Windows Media player for a long time, the audio playback tends to drop out randomly. To add to the problem, my hard drive finally crashed on the fifth day and I suspect not only hard drive problem but a motherboard problem as well (its been running since 2006) because the problem persist even removing the faulty drive. So I get a new motherboard, CPU, RAM, hard drive and went to re-install Focusrite Saffire Pro 40 on Windows XP again. This finally resolves the issue. Until now, I do not encounter even a single drop out in the playback and recording. It now works perfectly. LESSON: If your computer has some motherboard, hard drive and other related hardware/software issues, it can cause audio drop out in your audio interface. So you need to fix that one. Also as a recommendation, avoid using cheap Firewire PCI card at all cost. Invest in a very high quality PCI card recommended by Focusrite which are stated and discussed thoroughly in this document. At first, I do not read the manual in using this audio interface for details. It is because I assume Firewire operates similarly to USB. But it was not. I notice a lot of odd things would happen like a device suddenly disconnected, etc. Or the device is not detected by Windows XP, etc. IMPORTANT: Make sure to connect the Firewire cable from the Saffire Pro to your PC Firewire slot before you turn on the device. Make sure your PC and audio interface is OFF while connecting the Firewire cable to avoid any damage.